Whether you're trying to grow your customer base or boost revenues, referral marketing is an efficient and powerful tool to add to your customer acquisition arsenal. But all too often, people quickly throw together a basic “give $10, save $10” referral offer and call it a day. Even though this is a reasonable starting point, these folks might be missing opportunities to attract customers and get their friends to act on the referral. Successful referral programs are ones that are optimized and undergo regular testing to make sure there's alignment between the structure and design of the reward. With these pieces working together, you set yourself up to attract easy wins and build an effective growth engine. This is how to build referral programs that cater to your specific goals and get customers to respond the way you want them to. The way you structure your referral program depends on how you want to optimize it. Meaning, what you want to get out of it depends on how you design the offer. That's why structure, combined with clear and concise goals, helps you to get customers to react and helps you make sure customer quality is where it should be. After all, friends of existing customers are your brand's best customers. So there's no shortage of goals to choose from. Maybe you want to increase advocate share rates and friend conversions, or maybe you want to lower your customer acquisition costs (CAC). Maybe you're already acquiring a ton of customers through referral, but you want to increase the average order value (AOV) of referred customers. Whatever the case, it's crucial that you align the structure of your rewards program to the broader goals of your referral strategy. Carefully designing a referral program allows you to exercise granular control over specific outcomes. The referral type. Instead of the “do this, get that” formula, use other types of rewards like account credits, loyalty programs, or gift cards. Each of these works as a lever that helps you drive specific behaviors and reach key metrics. You can crank up one lever more than the others or dial them all up to get the outcome you want. Referrals are about creating interactions between people — advocates and their friends — as much as anything else. You can optimize this interaction by playing around with the levers. Let's go a little deeper and look at how these levers have been used by popular brands. 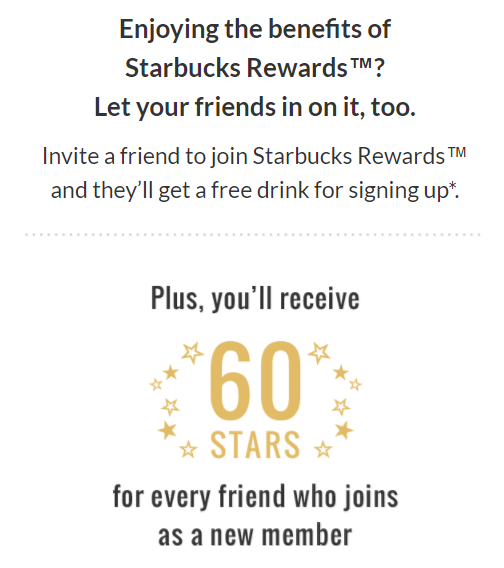 The referral type: The referral program is part of Starbucks' loyalty program. The more points advocates collect, the more rewards they get. For example, more than 300 points pushes members to Gold member status where they get a personalized rewards card. Starbucks introduced its loyalty program as a way to grow its business by getting people to buy more products. By all accounts, it's worked out well for them. They have over 12 million active users in the US alone and have earned over $2.65 billion in revenue from the program. Their primary goal is to get more people to use the loyalty program. Let's face it, lots of people buy Starbucks coffee but think of how much more growth there'll be when people are incentivized to buy through the loyalty program. By putting more focus on the “reward to advocate” lever, Starbucks has created a powerful way to grow its business. By making the value to advocates higher — the more points they get, the more bonuses you get — Starbucks has been able to get advocates to share more and entice more casual customers to consider joining the loyalty program to reap the benefits. The referral type: To encourage people to share the service more, DocuSign uses gift cards for a popular brand that resonates with its customers. With B2B SaaS, what works is giving advocates a relevant incentive to refer more people. For DocuSign, this centers around lowering their CAC and getting people using the product even deeper into the funnel they've created. Instead of offering advocates a discount or credit to future purchases, DocuSign offers them a gift card. It's an effective way to keep CAC low and LTV high because their “reward to advocate” is fixed. The “reward to friend” also helps with the CAC:LTV ratio because DocuSign can focus on acquiring customers at a predictable cost. This approach puts the focus squarely on customer acquisition and getting people to try out the product. This is not a program designed to grow a loyalty program. The referral type: For the advocate, this referral is a combination of accruing money and saving towards their next purchase. It hooks new customers who can save a max of 15% on everything they buy for the first time. This helps to build brand loyalty because they've created a customer experience that emphasizes the value that American Giant is known for, while also allowing these new customers to save. It encourages advocates to share more but at a fixed expense. By offering an account credit, American Giant is basically capping its acquisition costs. This is an excellent example of how to design a referral program for behavior. American Giant wants to get new customers to buy as much as possible while ensuring that advocates keep sharing. Both the “reward to friend” and the “reward to advocate” are cranked up to get these results. 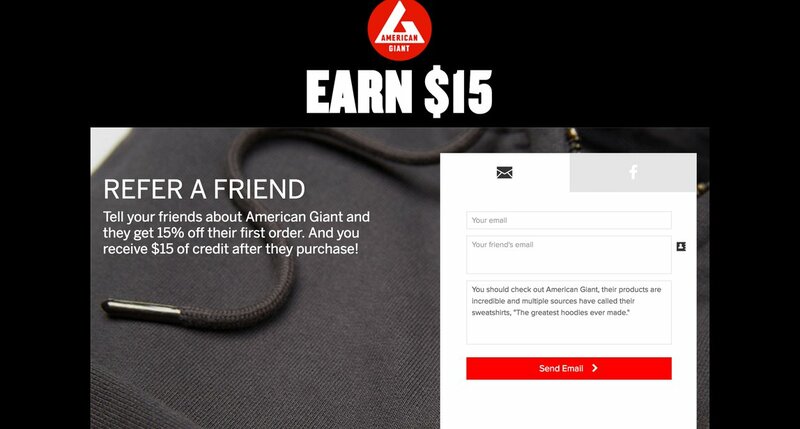 This approach has worked really well for American Giant because they've reported that 10% of their online sales come from their referral program. Start by figuring out what your marketing goals are and then use your referral program to meet those goals. You don't have to rely on standard programs to get there either. Play around with the levers until you find a combination that gets you results. If you want to increase conversions, you have to focus on the reward to friend lever. If advocates are already in the habit of sharing, the more emphasis you put on the refer a friend lever, they more likely you are to increase conversions. Get to know your customers because chances are their friends are similar. Use this information to create a referral program that resonates with potential new customers. Perhaps offer a free trial or increase the monetary reward to get referrals to take notice and do something.